Open the Option series tree → Series. Right-click on the series name. 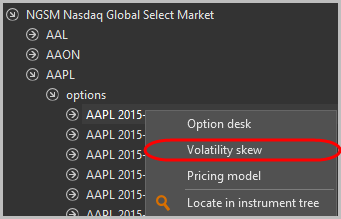 Select the Volatility skew command from the pop-up menu. By default, the volatility chart will open. The price range of the underlying asset is shown by the x-axis; the value of the volatility/theoretical price by the y-axis. The chart below shows the implied volatility of option prices. 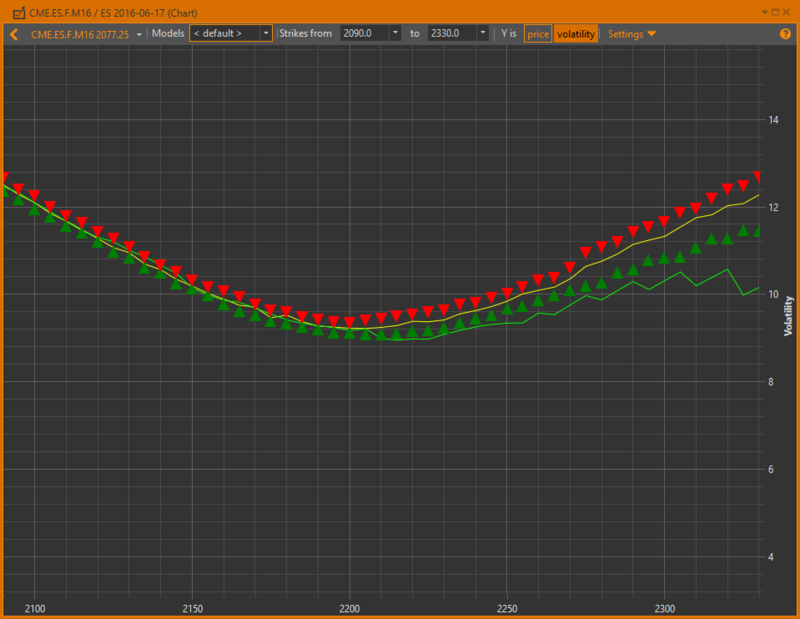 Volatility chart line displays data calculated using the current option series' pricing model. Markers are displayed only for the default model. The default model consists of two parts – a computation model (Black-Scholes or Black) and a volatility model. 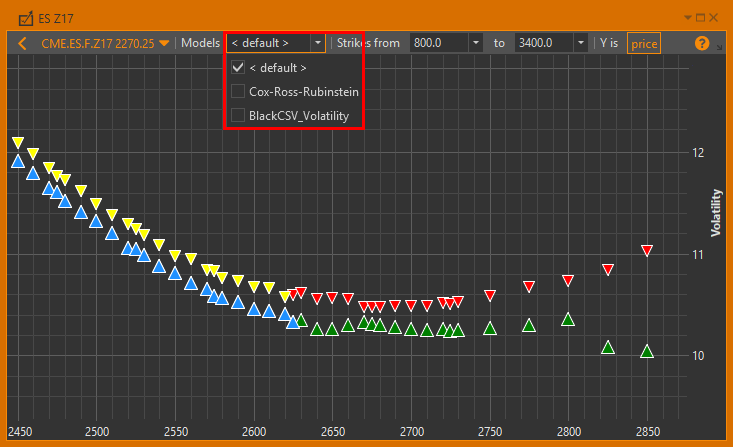 In Optin workshop the volatility values are calculated automatically. The screenshot shows a chart with implied volatility markers shown only for call options. You can simultaneously display IV curves for all pricing models created for this option series (see IV curves of pricing models). The skew is shown by a dashed line. To switch to the option theoretical price charts, click the price button on the toolbar. Markers are displayed only for the default model. 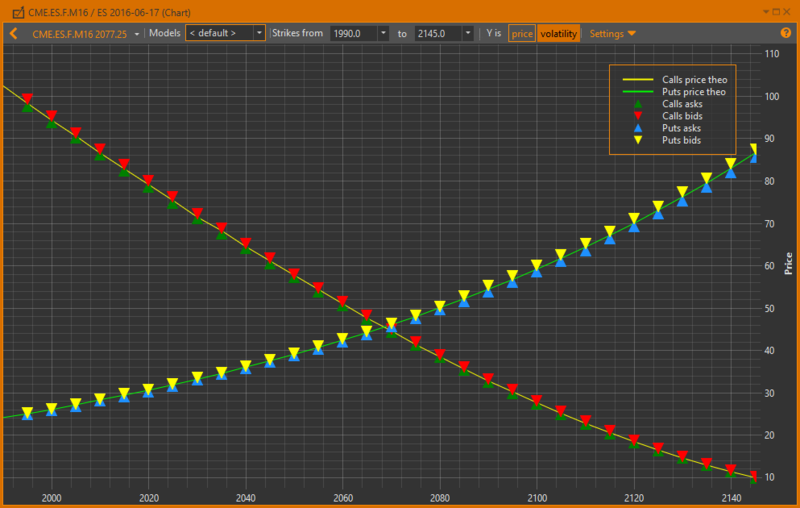 To see specific vector parameters of any point, hover the mouse cursor over the desired point on the graph. 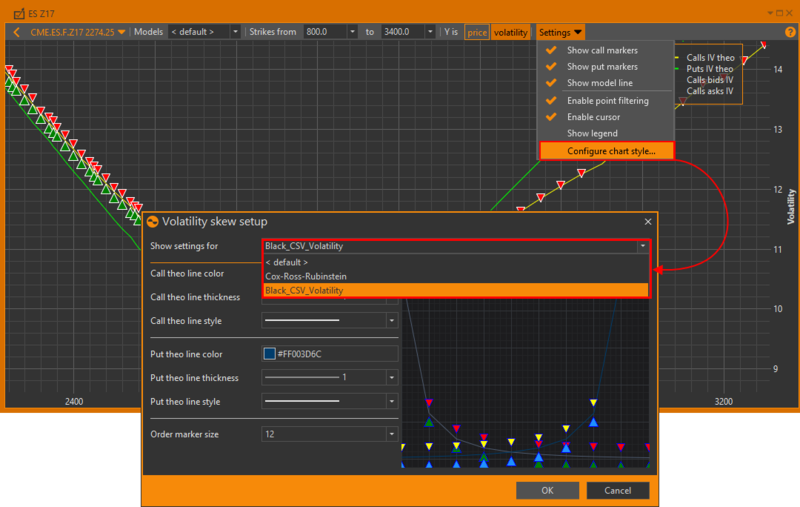 The tooltip showing vector parameters at the selected point will appear. 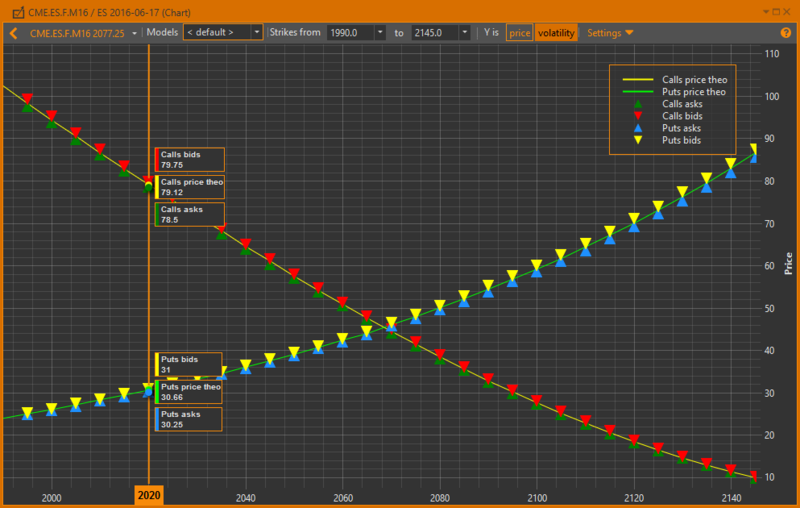 You can simultaneously display IV curves for all pricing models created for this option series. In the Models list, check the checkbox in front of the interest model. If you’re working with several charts simultaneously, you may set different line style for each of them. select the size of the orders price markers. Click the Settings button and select the Configure chart style command. 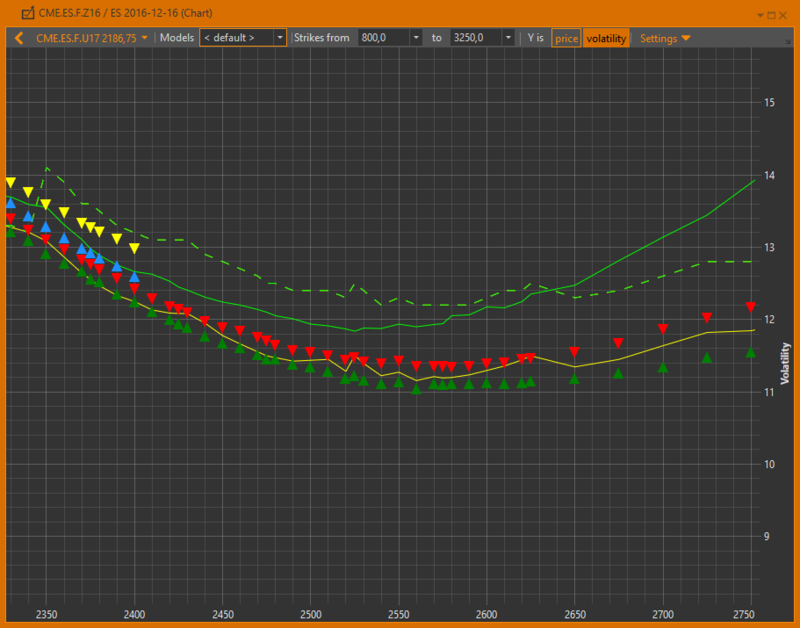 In the Volatility skew setup form select the color, thickness, line style (solid, dashed, dotted, etc.) and the size of the orders price markers and click the OK button to apply the settings. The last set parameters will be applied to the new chart. Mouse wheel – scroll the chart horizontally. 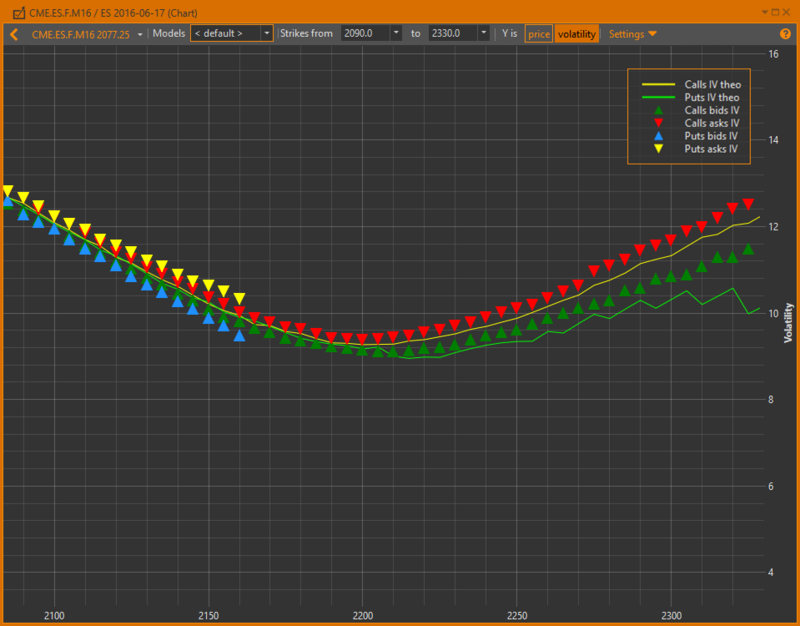 Shift+mouse wheel – scroll the chart vertically. To scale into a certain area, hold the right mouse button and select the area. To return to default size double-click the left mouse button on the chart. To move the chart, click the left mouse button and hold it pressed while moving the cursor.